A player's strike shortened the regular season to 15 games. A 24-day players' strike was called after Week 2. The games that were scheduled for the third week of the season were cancelled, reducing the 16-game season to 15, but the games for Weeks 4, 5 and 6 were played with replacement players, after which the union voted to end the strike. Approximately 15% of the NFLPA’s players chose to cross picket lines to play during the strike; prominent players who did so included New York Jets defensive end Mark Gastineau, Dallas Cowboys defensive tackle Randy White, San Francisco 49ers quarterback Joe Montana, 49ers running back Roger Craig, New England Patriots quarterback Doug Flutie and Seattle Seahawks wide receiver Steve Largent. The replacement players were mostly those left out of work by the recent folding of the Canadian Football League’s Montreal Alouettes and the 1986 dissolution of the United States Football League, as well as others who had been preseason cuts, had long left professional football or were other assorted oddities (such as cinematographer Todd Schlopy, who, despite never playing professional football before or after the strike, served as placekicker for his hometown Buffalo Bills for three games). The replacement players, called to play on short notice and having little chance to gel as teammates, were widely treated with scorn by the press and general public, including name-calling, public shaming and accusations of being scabs. The games played by these replacement players were regarded with even less legitimacy – attendance plummeted to under 10,000 fans at many of the games in smaller markets and cities with strong union presence, including a low of 4,074 for the lone replacement game played in Philadelphia) — but nonetheless were counted as regular NFL games. Final television revenues were down by about 20%, a smaller drop than the networks had expected. The defending Super Bowl champion New York Giants went 0–3 in replacement games, ultimately costing them a chance to make the playoffs and to repeat their championship. The final replacement game was a Monday Night Football matchup on October 19, 1987, with the Washington Redskins at the Dallas Cowboys. Along with the Philadelphia Eagles, the Redskins were the only other NFL team not to have any players cross the picket line and were surprising 13–7 victors over the Cowboys who had plenty of big name players cross the picket line. The 2017 film Year of the Scab, which aired as part of the ESPN series 30 for 30, documented the story of the replacement players who crossed the picket line to play for the Redskins. A fictionalized account based on the 1987 strike formed the basis of the film The Replacements. The Miami Dolphins began playing at their new home, Joe Robbie Stadium. This was also the Cardinals' final season in St. Louis; the team relocated to Tempe, Arizona, the following season. The eight-year old ESPN cable network became the first cable television broadcaster of the league, with its program ESPN Sunday Night NFL (subsequently rebranded as ESPN Sunday Night Football) debuting on November 8, 1987, broadcasting a series of Sunday night games during the second half of the season. Revenue sharing was changed so that NFL players received a portion of the ticket revenue, while the owners kept the revenue generated by skybox rentals. 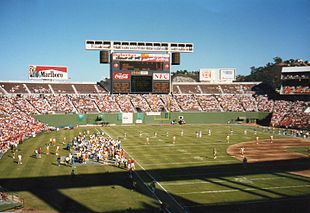 This led to many teams pushing for new stadiums which lowered many skybox suites from the less-desirable outer rim of a stadium to more desirable locations closer to the field (typically, the midsection or lower) so that the owners could charge more money for the suites, while similarly reducing the ticket revenue by replacing the higher-priced seats with lower-priced “nose bleed” seats. Overall, the number of available general admission seating was also reduced in favor of larger suites. Chuck Heberling retired during the 1987 off-season. He joined the NFL in 1965 as a line judge before being promoted to referee in 1972. Games that he officiated include the Hail Mary Game and The Drive. Fred Silva, who was a swing official in 1986, was given his own crew again. The 1987 NFL Draft was held from April 28 to 29, 1987 at New York City's Marriott Marquis. With the first pick, the Tampa Bay Buccaneers selected quarterback Vinny Testaverde from the University of Miami. Atlanta Falcons: Marion Campbell began his second stint as head coach of the Falcons, replacing the fired Dan Henning. Buffalo Bills: Marv Levy begin his first full season as the Bills' head coach. He was named as Hank Bullough's replacement after 9 games into the 1986 season. Indianapolis Colts: Ron Meyer begin his first full season as the Colts' head coach. After Rod Dowhower was fired after the Colts lost their first 13 games in 1986, Meyer promptly led the team to three straight victories to finish 3–13. Kansas City Chiefs: John Mackovic was fired and replaced by Frank Gansz. San Diego Chargers: Al Saunders begin his first full season as the Chargers' head coach. He replaced Don Coryell, who left after a 1–7 start in 1986. Tampa Bay Buccaneers: Leeman Bennett was fired and replaced by Ray Perkins. ^ Merrill, Elizabeth (June 9, 2011). "NFL replacements part of history". ESPN. Retrieved September 16, 2017. ^ Farnsworth, Clare (October 3, 2001). "NFL crossed the line on Replacement Sunday". Seattle Post-Intelligencer. Retrieved September 16, 2017. ^ "N.F.L. TV Ratings Drop". The New York Times. October 9, 1987. Retrieved September 16, 2017. ^ Allen, Scott (September 13, 2017). "Joe Gibbs won't say it, but 1987 Redskins replacements deserve Super Bowl rings". The Washington Post. Retrieved September 16, 2017. ^ Weber, Greta (May 26, 2017). "An ESPN Documentary About the 1987 Redskins Replacement Players Is the Ultimate Underdog Story You've Never Heard". Washingtonian. Retrieved September 16, 2017.